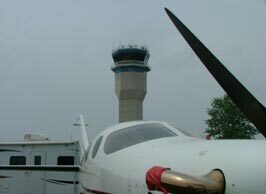 Where does one begin to explain their first trip to Oshkosh, is it the journey, or the first moment they see how many people and planes there really are? My first memorable moment was the day we arrived and started the setup stage. There seemed to be an endless amount of booths, each booth filled with something aviation related. I was in awe of how many people were there and the show had not even started yet. The story really begins on Sunday, the day we really began to get everything ready for the general populous. We woke early to drive to the lovely hangar D, where we would be spending the next week in a frenzy showing various people our new iPhone app and Max-Trax. After the first hour we were already done with the setup process so I went off with my camera to try to get some shots before the major crowds got there. The next day as my alarm woke me I knew the day was going to be hectic, getting into the truck I was nervous about what the day would bring. As soon as 9 o’clock came it seemed like an endless stream of people flowed into the hangar and I was forced to come out of my comfort zone and start selling. At first, I had no idea what I was doing. After a few potential customers, I soon got into the swing of things and became more comfortable talking and trying to talk up the Iphone app to complete strangers. Wow, never could I believe that many people were strolling by our booth at one time, talk about an endless stream. 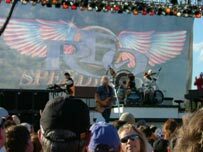 After everyone had left the hangar we prepared ourselves for the REO Speedwagon concert. 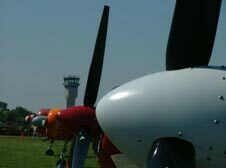 It seemed as if every person that had been at the airventure that day had shown up for the concert, and were ready to get the show of their lives. Needless to say REO didn’t disappoint, by playing their greatest hits and sounding as good as they did twenty years ago. As the day finally wound down to a close, I was relieved to be able to go back to the hotel and get off my feet for a few minutes. Soon enough it became time for Jeff (the boss) and I to go eat lunch and venture out to look at the various thousands of airplanes inhabiting the Oshkosh area. I was overwhelmed, to say the least, I had never seen that many airplanes in one place in my entire life. Line after line of single and twin piston aircraft as far as the eye could see and I mean that. What they called the North 40 was over a quarter mile at least. 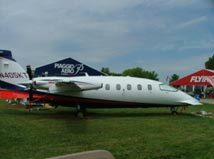 I saw one of my personal favorite airplanes of all time the Piaggio Avanti, a twin turbine airplane that is a pusher. In other words the props face backwards and they push the airplane instead of pulling it. What an awesome aircraft, fast but with style! Before I knew it, or was ready the alarm was doing what it does best and I was up and ready for another day. At the hangar we ready ourselves for the onslaught of people that was soon to begin. As 9 o’clock came around sure enough a few thousand people lined up outside came pouring inside and the day really began. 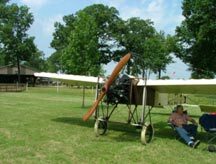 As the first wave of people died around eleven, I once again set out to see what kind of airplanes I could find in the few hours I was given. I learned fast the trams were the way to travel through Oshkosh, and boarded one to see where it would take me. I lucked out because it took me to the place I most wanted to go, the warbirds section. Row after endless row of P-51’s, T-6’s, and everything else from Huey helicopters to Mig jets. 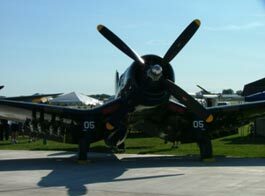 Then I saw my favorite plane of all time, the famous F-4U Corsair. The design of this plane is astounding, the curve of the wings as they enter the fuselage, the huge propellers that drove it through the air, all in all it is one of the most beautiful and innovative planes of all time. 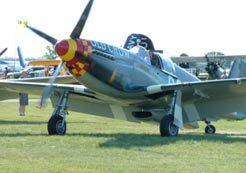 I could have spent the entire airventure there and not seen everything I wanted to see, but in the time I had, I got to see some of the most vicious looking planes ever designed. Wednesday was for me the most intriguing day of the entire trip, the day Fifi flew in. Never in my life have I ever been so close to something that struck fear into so many people’s lives and at the same time, but on the other side of the line, gave inspiration to thousands. The B-29 Superfortress nicknamed Fifi is one of the most intimidating, and largest planes I have ever seen in person. The thought that four propellers could fling this mammoth into the air was a mind boggling fact, which was reinforced when I saw her flying into the airport. From the ground one cannot even begin to understand the actual size of this beast, it dwarfs even the larger airplanes sitting around it and makes them look like toys. 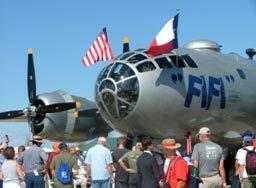 Standing next to it I realized just how enormous and impressive Fifi really was. Just about the second she landed the crowd engulfed the plane, each person taking hundreds of pictures and craning to get a better view and a better picture than the person next to them. As the turning point of the week started I couldn’t believe that it was already Thursday, the week was flying by faster than I could keep track of. It finally got to my favorite time of the day, hunting for pictures. 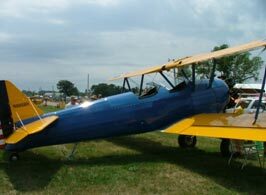 I slowly made my way to the vintage section, taking in the wonder of the old biplanes and tail draggers. The massive radial engines and interesting designs that people came up with to make a large heavy object get off the ground were astounding. It was amazing how an aircraft that was almost one hundred years old still looked as if it came off the showroom floor days earlier. I then heard the news that made my heart drop; an F-16 had crashed. From what I heard the pilot came in for low passes with landing gear down, and had come a little too far down and tapped the ground with his gear, effectively destroying the hydraulics. As he came into land and the front gear hit the ground the gear collapsed and he went sliding into the ground a few hundred feet from touchdown. Friday, down the home stretch, brought me one of the best experiences of the entire time. I was able to take a ride on the Ford Trimotor, built in 1929 the plane had as the name suggests three separate piston motors and was an amazing feat of engineering. With a single engine on both wings and then one more on the nose, the plane looked as if someone just decided to make something so out of this world and innovative that people would be in awe of its presence, that person succeeded in their goal. Shortly after getting off the plane I noticed people looking up, although it was normal with the thousands of planes constantly buzzing about, I knew something was different. 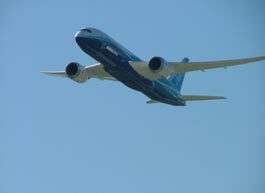 That was when I saw it, the Boeing 787 Dreamliner, a twin engine jet that made Fifi look like a midget. It seemed as if twenty people could fit inside just one of the engines, with room to spare. It was an astounding sight to see this absolutely huge airplane coming down and slowly touching down to the earth. My second to last day at Oshkosh, a place I called home for a week already, was a bitter sweet moment. Although I loved the trip, home was starting to sound really nice to my feet but we had just a little bit of time to go. 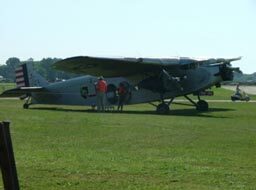 As I looked at the Airventure Today daily paper I saw what can only be described as the strangest flying machine I have ever seen. Burt Rutan’s Boomerang, it has an engine on the nose like a typical airplane but then has another one on just one of the wings, making it a twin piston but a very strange one. The idea is actually ingenious, as one prop turns one way the other turns the opposite way, effectively eliminating torque effect and P factor. At one point during the day I hear a big commotion and wonder to myself what it could be, only after going outside and seeing one of my favorite jets in the world hovering in one place did I realize what I had been missing out on. The Harrier, the Marine Corps signature jet, sits suspended in the air by the massive jets of hot air blowing straight down, I have seen this jet a few other times before this but every time I witness the astounding hovering ability of the plane I am in total awe of how it is even possible. My final day at Oshkosh was one to remember for sure. All day long the booths near us were getting ready to tear down and go home. I took one last opportunity to go take pictures and look at the amazing airplanes that were all leaving before returning to the booth to aid in packing up our stuff. As the day drew to an end I had a feeling of joy, but also of regret because I know I was unable to see everything I had wanted to see. I guess I will just make this an annual event now (go figure). This trip will be forever engrained in my body and soul as the trip that totally sold me that my future was in aviation. Never in my life have I enjoyed all the senses such as “The smell of Avgas in the morning” or the old adage of “Blueskies”. 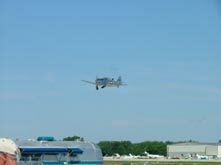 What a wonderful feeling to have at attending the worlds largest aviation airshow and flyin known as EAA AirVenture 2011! About the author: Cody Snyder is an 18 year old senior at Clarksville High School in Clarksville, IN. He is also attending one of the only Aviation programs in the country for high school students, Shawnee Aviation Program, based in Louisville, KY. His passion is to one day fly for the US Marines and is considering Purdue University Aviation Management program and ROTC. Currently he is working on his private license with approximately 10 of PIC time. He also is an avid golfer. He is the son of Jeni King and Chad Snyder.